Low energy light bulbs have been around for a while, but many people have been put off because they’re more expensive than conventional incandescent bulbs. So, what makes low energy light bulbs more efficient and are they worth the investment? The type of bulb we commonly think of as a low energy bulb is a compact fluorescent lamp, whereas traditional bulbs and halogen bulbs are incandescent lamps. There is a fundamental difference in their design. Traditional and halogen bulbs contain a filament of resistive tungsten wire that gets so hot when an electric current passes through it that it glows, giving off light. Both bulbs are filled with an inert gas to stop the filament catching fire. Both traditional and halogen bulbs convert around 2.5% of the electricity passing through them to light, with 97.5% being wasted as heat. Low energy CFL bulbs are coated on the inside with fluorite and are filled with mercury vapour. When elements inside the bulb heat the vapour, it gives off UV light which causes the fluorite to give off visible light, lighting your space. Because they work in this way, low energy lights give off around 10% light and 90% heat, which sounds like a small difference compared with conventional bulbs but actually means that these bulbs are 4X more efficient. 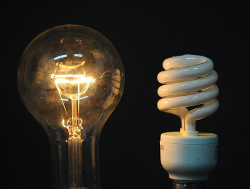 Because CFL light bulbs convert more electricity to light, this means that they need less electricity going through them in the first place to produce the same amount of light as a conventional bulb. This means that a 15W low energy CFL light is capable of producing the same light as a 60W conventional bulb. But low energy CFL light bulbs are still more expensive than their conventional counterparts. So do they make sense financially? In a word, yes. A standard 15W low energy bulb will usually cost around £3 and will save you £3 a year on your energy bills, which over its 5 year lifetime adds to a saving of £15. CFL bulbs are no longer the only low energy bulb option though. There are also efficient halogen bulbs available, which are 30% more efficient than conventional bulbs and are cheaper than low energy bulbs. If you’re willing to invest, LED bulbs are the most efficient and equally good value for money as low energy CFL bulbs – we’ll compare all four bulb types side by side in our next blog to tell you which is best for your pocket and the environment. 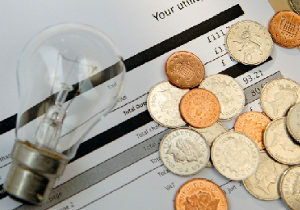 In the meantime, why not check out more of our home improvements that can save you energy and money? Our free tool even tells you what would save money in your house! This entry was posted in Energy Solutions and tagged Energy saving bulbs, Low energy lighting. Bookmark the permalink.